These photos tell it all, and it's just three out of many wonderful highlights we have experienced in the show ring. winning Reserve Best Dog (Reserve CC) at Crufts, England, 2006. Blicci is also: A home for dogs and dog lovers! Blicci is a small kennel in Værløse near Copenhagen, the capital of Denmark. The kennel is owned by Jane Raemy and Sven Thrysøe. We live in a cosy house with a nice big garden, and we have arranged our lifestyle mainly for the best of our dogs. We prefer it that way - and the dogs do, too! We spend most of our sparetime at home, and going for walks in the nature surrounding us. Some years ago we did some obedience training and agility, but unfortunately we do not have the time for this at present. But we love showing and attend most shows in Denmark and occasionally abroad too. Of course our dogs are running freely in the house and garden, and we would never have more dogs than we are still able to take a good care of everyone, including the oldies, who are living a happy life together with the younger ones. We have both been extremely fond of animals since our early childhood. 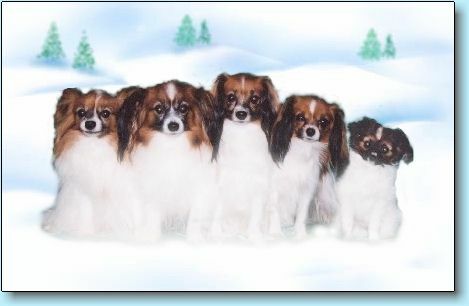 Already at 10 years old, Jane decided that some day she would breed papillons! 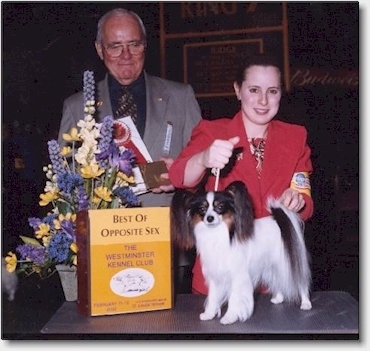 In 1981 she got her first papillon, and in 1983 she got the kennel name Hopalong and bred her first litter. Jane's first homebred champion, Ch Hopalong Sweet Chianti, was born in 1985. 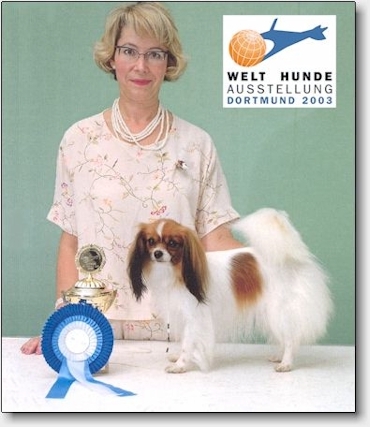 Sven became interested in papillons in 1984, he started showing and breeding as co-owner of the Kennel Pepstar. In 1992 he got his own kennel name Blicci and by then he had already had she success of breeding several champions. 1992 was also the year when we moved together, but for some years we had each our kennel name. The Hopalong papillons were known in the Danish papillon society as "the small cuties" - and Jane still seems to prefer this type! 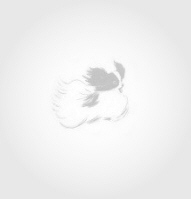 - but from 1997 both small cuties and the slightly bigger type of dog were joined together in Blicci Papillons & Phalenes. No breeder can succeed all by himself. 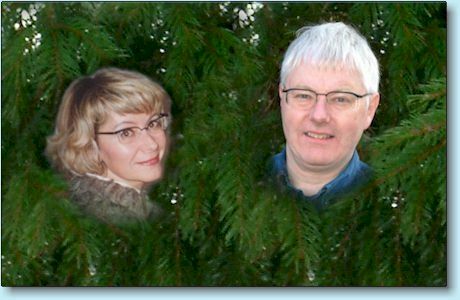 We are all standing on the shoulders of the breeders who were there before, and it is an advantage to co-operate with other breeders so that together we can contribute to a good result. This is also the reason why we are pleased to see the progress of others, because this means progress for the whole breed. The Blicci owned and bred dogs have reached fantastic show successes in the last many years. 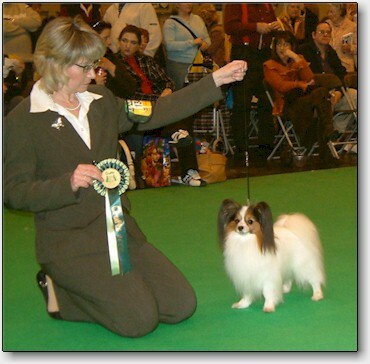 Both our papillons and our phalenes are top winning in Denmark and abroad. Among our show achievements are wins at Westminster, the World Dog Show and Crufts. We have exported papilllons and phalenes to Norway, Sweden, Finland, Holland, Belgium, Germany, France, Switzerland, Spain, Canada, USA, Puerto Rico and Russia. You can see more about our recent wins on the page News. You can see our own dogs and a good deal of the dogs of our breeding on the page The Dogs, which is being currently updated.